We are offering wide range of Double Chamber Packing Machine. These chamber packaging machines are particularly designed by our veteran professionals in sync with universal accepted norms using most favorable quality components and refined technology under the direction of our quality specialist. Along with that, these chamber packaging machines are carefully checked on a mixture of parameters of quality to make certain high performance at users end. 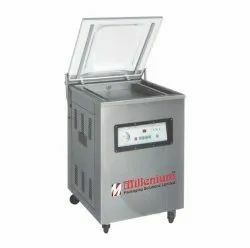 We are prominent manufacturers of an excellent range of Single Chamber Vacuum Packaging Machine. 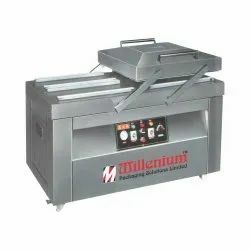 These machines are fabricated as per the industry standards.These versatile and latest in technology machines are used for vacuum, multiple gas flushing and multiple cycle capability.These machine make packaging simpler with the ease of placing the product with the bag in vertical fashion.